In Marina Cruz’s works, both the method of display and the individual images operate simultaneously on several different levels. She is predisposed in each exhibition to use her diverse collection of antique, nominal, and semantic material in such a way as to bring into attention some characteristic of painterly representation. The astute presentational tactics; the devices of display and the source of her imagery; the recollection of events in her family history and the history of her depicted objects, pile the many layers in Marina Cruz that are waiting to be surfaced and understood. For this reason, notwithstanding her intentionally nostalgic use of old things and old lives, we suitably recognize Cruz’s practice as a meticulously contemporary one, primarily concerned with the conflicting nature of the painted object and the actual event behind it: the visibility and invisibility of its subject; the simultaneously physical and yet ethereal nature of the painted image. There’s a flair of a simultaneously tangible but untouchable presence felt in the photographs uncovered by Cruz and her grandmother from more than fifty years ago which serve as the source for her paintings. 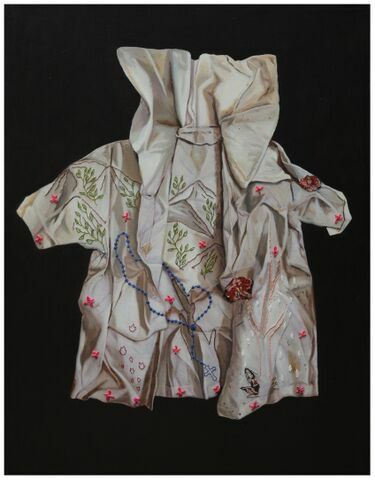 She deals with the stories of survival and recapture of the dresses of her twin mother and aunt which she summons in her exploration of the life and after-­‐life that inhabits these objects. Her painting process, like one’s memory, is often faintly trailed, recognizable under her elusive lexis of portraiture.